It's that time of year again...you know, the month when I kill myself trying to come up with new content every day and operate under the delusion that this frenetic writing pace will magically translate into more regular/frequent posting in the months that follow. But hey, it's fun while it lasts and it's better than nothing. 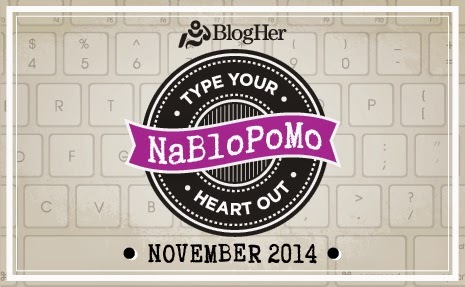 In other words: National Blog Posting Month (aka NaBloPoMo)! So I hope you'll make time to visit a little more often these next few weeks--I'm looking forward to settling into a neglected but needed writing groove. Love it! Go, go, go.... You can do it!! Would like to commit to this myself but I just know I don't have it to give in this season. It's more like "write when I can't stand not to" for me right now.